This simple hotel is set in Recife. A total of 24 rooms are available for guests' convenience at Saveiro Hotel. Saveiro Hotel is not a pet-friendly establishment. Featured amenities include a 24-hour business center, complimentary newspapers in the lobby, and a 24-hour front desk. This hotel has 2 meeting rooms available for events. 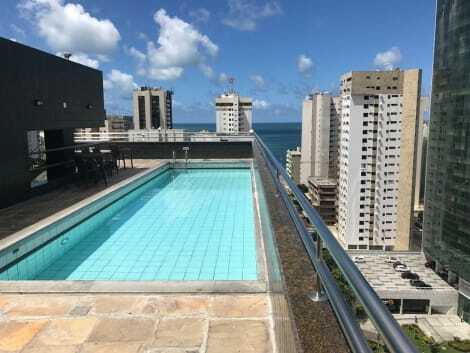 Offering a fantastic location, Hotel Veraneio is just 250 metres from Guararapes International Airport, and a 5-minute drive from Boa Viagem Beach. It offers free Wi-Fi and 24-hour room service. Rooms have bright white tiled floors and walls. All are equipped with air conditioning, LCD TV with cable channels, and have en suite bathrooms. Guests at Hotel Veraneio can enjoy a daily breakfast, which includes natural juices, cheeses and fresh breads. Veraneio is 9 km from the centre of Recife, and 5-minutes´ by car from Recife Shopping Centre. With a stay at Imperial Suites in Recife (Boa Viagem), you'll be within a 10-minute drive of Boa Viagem Beach and Recife Shopping Center. This hotel is 5.9 mi (9.5 km) from USA Consulate and 10.3 mi (16.5 km) from Pernambuco Convention Center. You can enjoy a meal at Pedra Bonita serving the guests of Hotel Manibu Recife, or stop in at the grocery/convenience store. Relax with a refreshing drink at the bar/lounge, the poolside bar, or one of 2 bars/lounges. Buffet breakfasts are available daily from 6:30 AM to 10 AM for a fee. Make yourself at home in one of the 90 air-conditioned rooms featuring kitchens with refrigerators and stovetops. Flat-screen televisions with cable programming provide entertainment, while complimentary wireless Internet access keeps you connected. Conveniences include phones, as well as safes and desks. Make yourself at home in one of the 162 air-conditioned rooms featuring iPod docking stations and flat-screen televisions. Complimentary wireless Internet access keeps you connected, and cable programming is available for your entertainment. Private bathrooms with showers feature complimentary toiletries and hair dryers. Conveniences include phones, as well as safes and desks. lastminute.com has a fantastic range of hotels in Recife, with everything from cheap hotels to luxurious five star accommodation available. We like to live up to our last minute name so remember you can book any one of our excellent Recife hotels up until midnight and stay the same night.